Energy Minister Berat Albayrak is set to visit Israel by the end of this year to conclude an agreement for the building of a natural gas pipeline to Turkey, the Israeli energy minister said Wednesday. Israeli Energy Minister Yuval Steinitz said both countries decided to accelerate efforts to conclude by the end of this year an intergovernmental agreement that will enable the construction of a pipeline from Israel to Turkey. 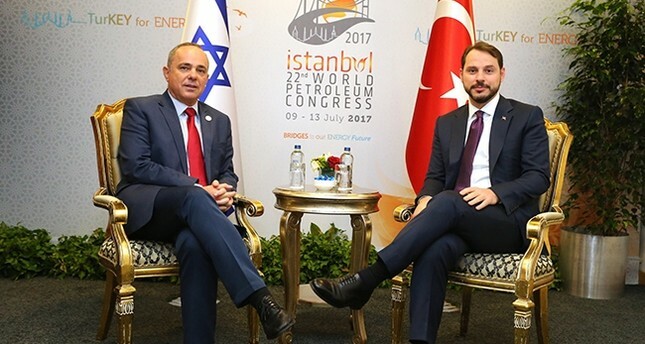 "Hopefully, Mr. Albayrak will pay a visit to Israel this year in 2017, which will help us accelerate and try to conclude this agreement," the minister said at the 22nd World Petroleum Congress in Istanbul after meeting Albayrak. He added that no exact date had been fixed but it would take place in the coming months..
Steinitz said that energy is an important token in the process of developing normalization and bilateral relations between Turkey and Israel. Noting that energy-related developments in the region are changing rapidly, Steinitz said that the important natural gas reserve explored in the Eastern Mediterranean is an example of this. Israel is searching for energy partners to develop its Leviathan natural gas field in a bid to make it economically feasible. Emphasizing that there are scientific studies showing the presence of more natural gas reserves in Israel's exclusive economic zone, Steinitz said that there is a large amount of natural gas in the region, including off Cyprus and Egypt. As Western Europe meets its natural gas needs from resources in Russia and the North Sea, Steinitz said that resources in the North Sea are on the verge of running out, adding that a serious decline in natural gas production in the region is expected. He remarked that the importance of explorations in the Eastern Mediterranean increased in light of these developments, continuing: "We believe that the resources in the North Sea will be replaced by the resources in the Eastern Mediterranean in the coming period. Europe will receive natural gas from the Eastern Mediterranean and this region will become a reliable resource." "We want to build a pipeline stretching from Israel to Turkey in order to able to export natural gas from Israel to Turkey," Steinitz said, adding that the Israeli gas could be delivered to Europe and to the Balkans through Turkey. The East Mediterranean region has several natural gas fields that as of yet have not been commercialized with pipelines or LNG facilities, such as the Leviathan field with a capacity of 620 billion cubic meters (bcm) and the Tamar field with 283 bcm off the Israeli coast. The Leviathan field, discovered in 2009, holds an estimated 613 bcm of gas with 39.4 million barrels of condensates. The field is set to begin production in the fourth quarter of 2019. Steinitz highlighted a scientific exploratory evaluation that reveals that the majority of the significant oil and natural gas reserves in Israeli waters have yet to be explored. "It was evaluated that more than other 2,200 billion cubic meters of natural gas have yet to be discovered," he said. Relations between Turkey and Israel came to a halt in 2010 following an Israeli naval raid on Turkish aid ship Mavi Marmara, en route to deliver humanitarian aid to the blockaded Gaza Strip. The raid killed 10 people. The Israeli government took a step toward reconciliation on March 24, 2013, when Israeli Prime Minister Benjamin Netanyahu, under the encouragement of U.S. President Barack Obama, apologized for the mishandling of the raid during a conference call with then Prime Minister Recep Tayyip Erdoğan. Israel also agreed to pay compensation to the families of the victims. After nearly six-and-a-half-years, a reconciliation deal was reached between Turkey and Israel and ratified in Parliament on Aug. 20 last year before being signed into law by President Recep Tayyip Erdoğan on Aug. 31.